4. Design a logo for a company that designs and manufactures packaging for CD ROMs. The logo must reflect the efforts the company has put into using recycled materials and its positive approach to protecting the environment. The design must also reflect the product - Music CDs. 4a. In the two boxes below draw two rough designs for the logo. Alongside each design, add explanatory notes. 4b. In the boxes below produce two styles of writing that could be used on a CD ROM containing a type of music of your choice. (ie. Rock, Jazz etc.....) In both cases write the word MUSIC. 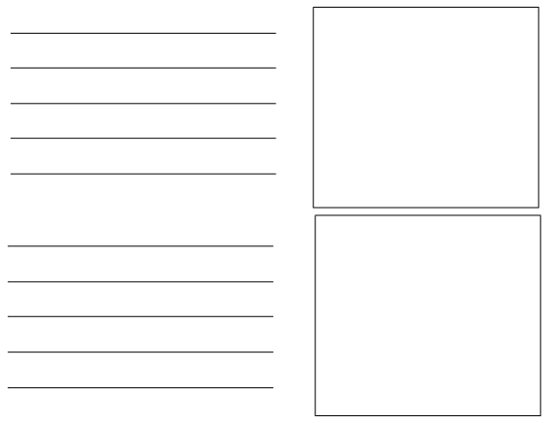 Add notes to explain each style of writing you have developed. 5. In the space below select your best design for the recycling logo and combine it with your best style of writing to produce a final logo / symbol. The symbol should effectively promote recycling within the CD ROM manufacturing industry. The word RECYCLE should be used along with the logo you have selected.